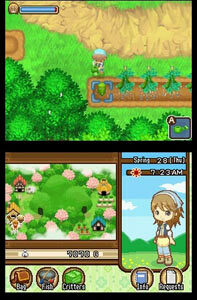 Harvest Moon: Tale of Two Towns is a Life Simulation Role-playing Game (RPG) for Nintendo DS. 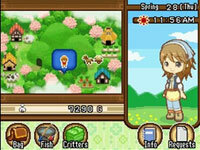 The game features classic Life Sim gameplay involving farming, the raising and care of animals and eventual marriage. Additional features include an all-new storyline involving the player in an ongoing rivalry between two towns, the ability to play as either a boy or a girl, an in-game quest bulletin board system, wireless functionality allowing you to visit friends in-game fields, new in-game activities and more. 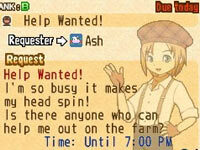 Classic Harvest Moon gameplay with multiple additions. 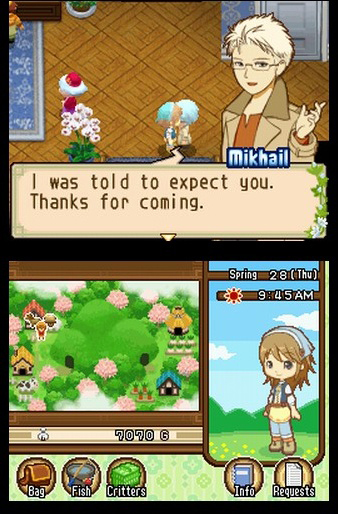 Konohana and Bluebell villages were once the friendliest of neighbors. Then a huge dispute erupted between them, over all things, food. 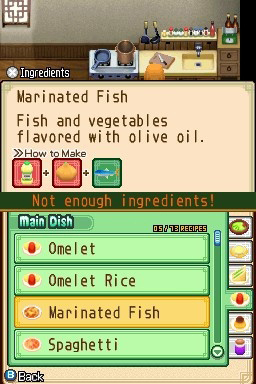 Both towns were certain that their cooking was the best in the world. This fierce food feud has transformed the two happy neighbors into the bitterest of rivals. Eventually the harvest goddess steps in and collapses the tunnel connecting the towns. After years have past the goddess reconsiders and decides that the breach between the two villages should be mended and that you are the best hope to do it. As a new farmer to the area, you choose which village to live in. Will it be Eastern-styled Konohana with its abundant fields of crops, or the animal-loving, European-styled Bluebell? Pick a home, build a thriving farm, and compete in a huge variety of festivals. Develop your skills enough, and you might even find a way to bring these two towns together once again. 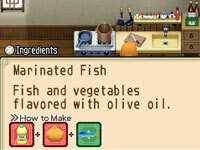 Along with the classic Harvest Moon farming, animal husbandry and spouse searching activities Harvest Moon: Tale of Two Towns features a variety of new and expanded activities. 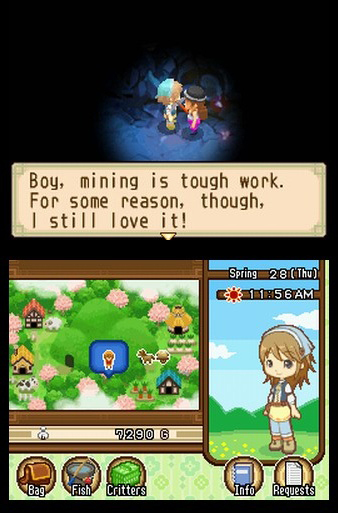 Some of these include: the ability to dig ditches to water crops, and use a horse and move crops and other items to market, mining for profit, festivals that focus on cooking and a message board system to receive quests from townsfolk. Konohana and Bluebell villages were once great neighbors until a huge dispute erupted between them over FOOD! Yes, food. They were both certain that their cooking was the best. This bitter feud has divided the once-close towns, turning neighbors into enemies! 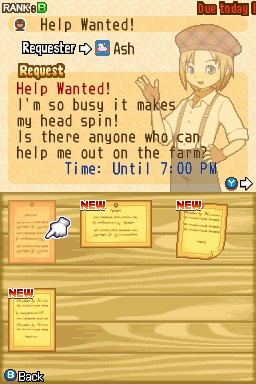 As a new farmer to the area, it's up to you to choose which village to live in. Will it be Eastern-styled Konohana with its abundant fields of crops, or animal-friendly, European-styled Bluebell? Pick a home, build a thriving farm, and compete in a huge variety of festivals. 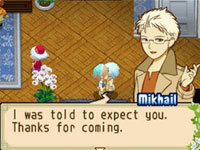 Develop your skills enough, and you might even find a way to bring these two towns together once again!